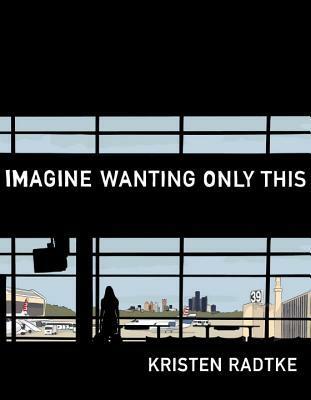 Imagine Wanting Only This, a graphic memoir, opens with Kristen Radtke, the author with her favorite uncle (Dan), a celebrity wrestler in a small Wisconsin town. He’s a volunteer fireman who shows Kristen, as a child, the magical spectacle of numerous flashing fireflies. This black and white inked memoir with grey washes is beautifully drawn and showing almost photographic image outlines of people and detailed backgrounds. Heart disease is the health focus. There is a bleak optimism to this tale. It’s filled with ruins (buildings, towns, cultures, documents, and persons) as an inevitability; and justification to search out the wonders all around us, even in those ruins. Part of the optimism of Kristen’s memoir is its movement back and forth in time; where the past, present and future events allow the reader to play with possibilities. I highly recommend this memoir. The memoir jumps in time to Kristen, leaving with her boyfriend, Andrew, for post-apocalyptic (to Kristen) Gary, Indiana, from her undergraduate city of Chicago (Art Institute of Chicago) where she, though her skin peeled from the chemicals, enjoyed the darkroom and slowly watching images emerge. She explores a skeletal cathedral in Gary’s center and finds a stash of photographs, which she takes. Kristen learned much later the photos had been left there as a memorial to Seth Thomas who died at age 23 when accidentally hit be a train during a picture-taking outing. Jumps to Kristen, age ten, when Uncle Dan moved to Colorado to work in a ski resort, he marries Sonia and they have two boys. She interviews Dan as a person-most-admired school project. Jump to Kristen at the Art Institute when Dan tells her doctors are going to shock his heart after putting in a pacemaker. He sends Kristen a photo of himself hooked up to lots of tubes and devices; which scares Kristen and she deletes the photo … then Kristen’s mother calls her to say Uncle Dan died. Not doing justice to her whirlwind travails, Kristen graduates, travels in Italy, loses Seth’s photos, attends grad school in Iowa (her best time), travels through the Philippines and Vietnam, later to Iceland, lives in Kentucky (most insomniacs, loneliest place), and ends up in New York City. While in Iceland at age 24 during the Spring when the sun doesn’t set, time seems to stop. There’s a two page spread (222-223) “It feels like being held forever” which the reader can try to imagine in color … a wonder to behold … Imagine Wanting Only This.